Not to brag but I often find myself on the receiving end of the compliment i.e.“You smell Amazing”. The strange part is that I wear cologne only on formal occasions because sadly most scents make my head hurt incessantly. Yet I always seem to smell good naturally. Its because over the years I have started to appreciate and embrace the natural scent of my body. With making little lifestyle tweaks, almost anyone can improve on their natural body scent. A healthy body operates with a pH balance of around 7.365 which is a little alkaline. Research has proven that diseases can't survive in an alkaline environment. The alkalinity of your body not just cleanses acidic toxins out of your body but it also improves the natural odor of it. Our bodies only need 20% of acid composing foods and the rest of 80% should be alkaline composing foods. Excessive consumption of dairy, red meat, spicy food, SUGAR, processed foods, coffee and tobacco will not just mess with the pH balance of your body but also cause bad body odor. Drinking lots of water is an obvious way of smelling good. Water flushes out toxins and support natural detoxification. Add lemon to a glass of water to freshen up your breath. Moisturizing not only keeps your skin wrinkle free, it also helps make the scent stay longer. After you shower, spritz perfume on a freshly moisturized skin. 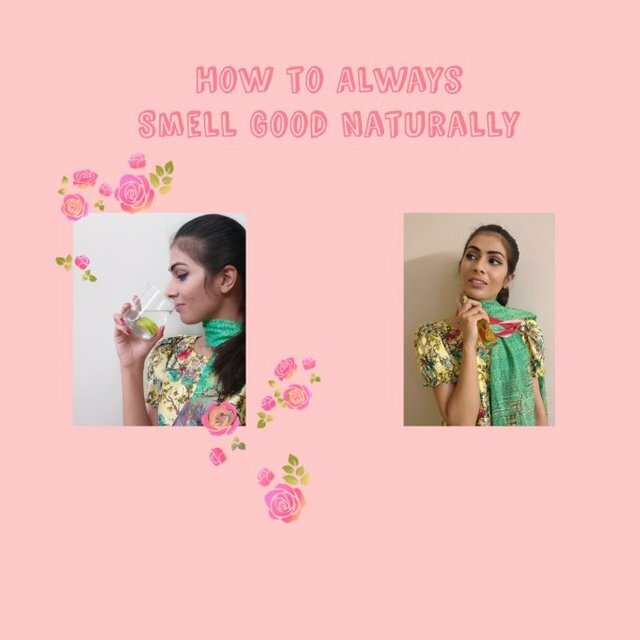 What it does is create a layer of scent and the fragrance stays for longer period. If you absolutely cannot wear perfume, rub lemon juice or coconut oil onto your moisturized arm pits, elbows and under the knees. Lemon and coconut oil are natural body deodorants. Mix equal parts of cornstarch, baking soda and coconut oil in a jar and use in place of a deodorant. It works just as good as any chemical based deodorant. Another inexpensive natural deodorant is Alum Powder(Fitkari). Rub Firkari onto your arm pits after you take shower. It keeps you odorless even in extreme summers. Parsley has anti-bacterial properties that helps fight bacteria causing odor in the body. It also has a good source of chlorophyll that has alkalizing properties.